Well, this is interesting. On the very day of Consult Hyperion’s 20th (yes, 20th) annual Tomorrow’s Transactions Forum to discuss the future of secure electronic transactions and much besides what should fall through the internet tubes but the fifth annual “ING International Survey Mobile Banking 2017 – Cashless Society“, which surveyed nearly 15,000 people across 15 countries, and found that one in five (21%) people in Europe now rarely carries physical notes and coins, and a third (34%) would go completely cashless if given the choice. Gin and contactless is my second favourite cocktail (after the Moscow Mule). Like those 34%, I’d like to be given the choice, but there are still places that won’t accept cards (such as the Real Ale bar in Wembley Stadium) which is why I went to the gin bar instead (as shown above). But these are becoming fewer and farther between, and not only in London. Ha! 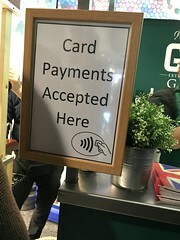 Even on Southwest Trains you can pay using contactless cards or Apple Pay and, when the new Chinese owners take over later this year, I imagine that Alipay and WeChat will be on the menu too. When do we get to wave goodbye to cash in Woking then? Well, sadly no time soon because while the trains have contactless, the ticket machines don’t (and I shouldn’t have to go to ticket machines anyway, but that’s a different point). But in ten years? 20 years? Britain to go cashless in 2043? I would imagine the graph turns out to be show cash asymptotic to zero rather than zero, but while I’m not sure that the number of “cash” transactions will ever reach zero, because some people will always want to use some form of immediate and anonymous payment system, I am sure (as I told the BBC’s “Wake up to Money” chap when he called to invite me on this morning) that William Gibson’s words in “Count Zero” are prescient: “He had his cash money, but you couldn’t pay for food with that. It wasn’t actually illegal to have the stuff, it was just that nobody ever did anything legitimate with it”. By 2043? Sure. But rather than just let it happen, we really need to set a national policy about it. Therefore another vision for 2043 might be that cash becomes a class issue, where the middle classes never see cash from one week’s end to the next (except for the purpose of aiding and abetting tax evasion by paying the builder in £50s) but the underclass, trapped in cash, are excluded from the world of bank accounts and cards. This will be a good topic for discussion at this afternoon’s excellent expert panel on inclusion chaired by our CEO Neil McEvoy with Katie Evans (Money and Mental Health), Susie Lonie (who has years of experience in emerging markets), Elizabeth Duke from Carta Worldwide (who build pre-paid schemes for the unbanked) and our very own Paul Makin (the man who did the original feasibility study for M-PESA). Great stuff. ← Does it matter if people tap their phones or not?